Camel Audio synth technology to be integrated into GarageBand? The Transform Pad is designed to enable fast and simple sound tweaking. It seems that Apple may have moved quickly to implement technology developed by Camel Audio, which the Cupertino company seemingly purchased earlier this year, into the Mac version of GarageBand. 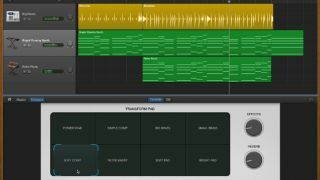 Apple Insider has spotted that a GarageBand page on the Apple website features details of 100 new "EDM- and hip-hop-inspired synth sounds," some of which you can see demoed in video. This video illustrates what Apple calls the Transform Pad, a new Smart Control that not only enables you to tweak the sounds to taste, but also bears an uncanny resemblance to the sound editing pad that featured in Camel Audio's Alchemy Mobile app (see below). It seems like more than coincidence that the Transform Pad should arrive in GarageBand just months after the Apple/Camel Audio news broke. Is it just this feature that's been borrowed from Alchemy, we wonder, or has its synthesis engine made the jump to Apple's entry-level DAW, too? We'll be able to make an assessment once the new version of GarageBand is available, though a release date is still to be confirmed.